in almost everything that Elvis did, starting with his early career, somebody was telling him what to do. Nobody really said to him: “Elvis, just be yourself, and we’ll tag along, and every once in a while we’ll grab something that we think is interesting, and we won’t ask you to do anything special for us, no posing, just go and live your life.” That’s essentially what I did. Because not only was I shy, but he was shy also in a way, and I did not expect any more from him than to be himself. While the nonsense about the hillbilly and the plow is typical Lester Bangs overkill, it’s easy to find the everyman superman extremes in the threshold-of-fame glory of “Elvis at 21.” When I went back to the Michener for another look, I saw the same range in the handsome African American kid from Louisville who became Muhammed Ali, but that exhibit’s compilation of relatively small-scale photographs, as fine as it is (especially the pieces by Gordon Parks), doesn’t do for Ali what the grand-scale imagery does for Elvis. 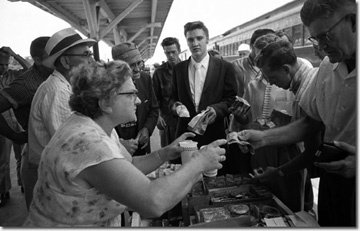 Wertheimer’s richest images were mined in New York, on the day of a concert in Richmond, Virginia, and on the long train ride back to Memphis that began at Penn Station. There’s a special, natural charm about the photos of Elvis at home on Audubon Drive with his mother, father, friends, and onetime high school girl friend. The shots of him with females of any age offer moving, sometimes amusing evidence of his magnetism. In New York there’s the bespectacled, white-gloved, primly and properly attired girl with a copy of the Daily News under her arm as she gets Elvis’s autograph, then breaks down, burying her face in her hands; in Richmond the pretty waitress Elvis is eyeing as she takes his order may be the same evening-gowned beauty he’s romancing backstage in a sequence of clinches that ends in The Kiss, one of Wertheimer’s most frequently reproduced images. Among the few relatively ordinary photographs here are those documenting Elvis’s appearance on the Steve Allen show (singing “Hound Dog” to a bassett hound and playing Tumbleweed Presley in a cowboy skit with Allen and Imogene Coca). A haunting exception is the shot of Presley stiffly seated at the piano in a large, empty, bare-walled rehearsal room. The Edward Hopper austerity in both lighting and mood is such that you might think Wertheimer had the association in mind, or at least recognized it when he saw David Adamson’s masterful 36 x 48 enlargement. The isolated-looking person at the piano is as far from the viewer in the work’s “painted” remoteness as the people at the counter in Hopper’s Nighthawks; the resemblance is also signaled in the stark singularity of the randomly spaced folding chairs, the flatness of the light passing through the high windows, the way everything seems about to dissolve into some impressionistic element of pure atmosphere, and, most Hopperesque of all, the smooth spare presence of some anonymous urban structure vaguely visible outside the window. The first image you see as you enter the exhibit is the lonely figure of an overcoated young man from the provinces standing in front of a Manhattan hotel (the Warwick) on a chilly March night. As with the shot in the rehearsal room, what makes the pictured moment special is Presley’s anonymity. Months later in July the last New York image is a long shot of Elvis talking with some people in the vast concourse of the old Penn Station. What’s striking here is the sheer ordinariness of the scene, the super-star-in-embryo looking like any other in-transit passenger about to board a train; no entourage, no mob of photographers. “Ali and Elvis: American Icons” will be at the Michener Museum through May 15. The Wertheimer quotes are from classicbands.com and smithsonianmag.com. The museum is located at 138 S. Pine Street in Doylestown, Pa. For more information on hours and admission rates, call (215) 340-9800 or visit www.michenerartmuseum.org.